Inefficiencies are weighing down the corporate payments segment (see Figure 2.4). 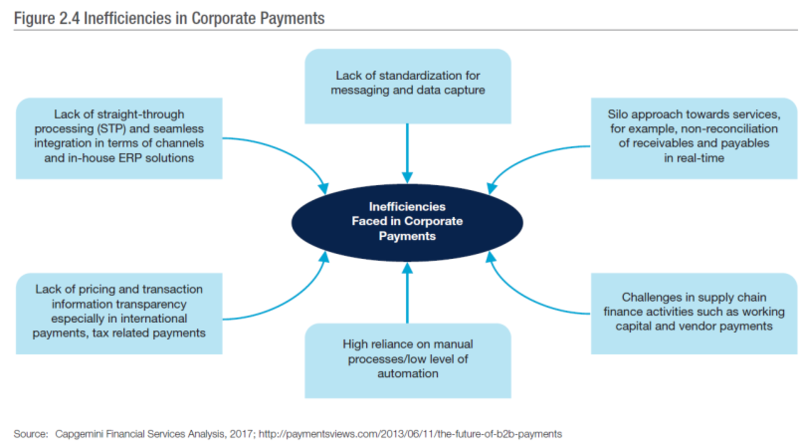 A lack of standardization of messaging and data capture and of real-time synchronization between receivables and payables create inconsistencies and operational inefficiencies in corporate payments. Other pain points include a high reliance on manual processes and a lack of seamless integration between multiple channels and in-house ERP solutions. However, by leveraging new technologies and harnessing centralized payment solutions, corporates will be able to address the existing inefficiencies. Integration of payment service offerings with ERP systems, and leveraging new technologies such as blockchain, are also expected to produce results.